Paris St-Germain won the French League Cup for a record fourth time as Edinson Cavani's double helped them to a 2-1 win over Lyon. 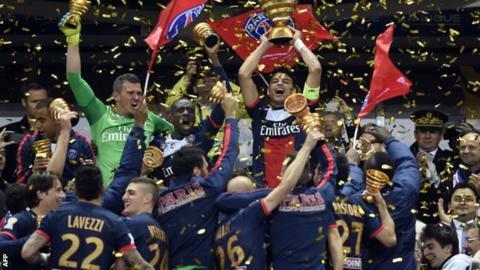 Cavani opened the scoring from close range after 178 seconds, the second fastest goal in a Coupe de la Ligue final. Alex had a goal disallowed for offside before Cavani doubled the lead from the penalty spot at Stade de France. Alexandre Lacazette pulled a goal back for Lyon with a low 20-yard finish. They pushed on for a second but, despite prolonged spells of pressure, rarely threatened the all-important equaliser. This was the 16th of 20 Coupe de la Ligue finals that has has been won by the team that opened the scoring. PSG, who are 10 points clear of second-placed Monaco in Ligue 1, remain on course for a domestic double but were knocked out of the Champions League quarter-finals by Chelsea. They lost to Montpellier in the French Cup last-16 back in January. The victory brings manager Laurent Blanc his first major trophy at PSG, after replacing Real Madrid-bound Carlo Ancelotti in June. He had previously won the competition with Bordeaux in 2009. Lyon, meanwhile, become the first team to have lost four French League Cup finals - their only victory came back in 2001. Their hopes of winning it for a second time were not looking good within four minutes. Maxwell cut inside from the left, chipped the ball past keeper Anthony Lopes, and Cavani beat his man to tap the ball into an empty net. The Uruguayan has scored 15 league goals this season since signing from Napoli for £55m in the summer but has often played second choice to striker Zlatan Ibrahimovic, who is Ligue 1's top scorer with 25 goals. But, with Ibrahimovic injured, Cavani got the opportunity to play in his favoured central role - rather than right in a three-pronged attack - and almost doubled his tally soon after with a fierce volley that was well saved by Lopes. Cavani was heavily criticised for missing a good opportunity in PSG's Champions League exit at Chelsea and he put in another wasteful showing in the 1-0 defeat at Lyon a week ago. It looked like being his night though when, after former Chelsea defender Alex had a goal disallowed for offside, he made it 2-0 from the penalty spot, finishing emphatically after Lucas was taken out by Lopes. Contact may have been made just outside the penalty area but the goalkeeper was nowhere near the ball as he rashly charged out. Lyon and PSG met each other for the sixth time in the Coupe de la Ligue, a record in the competition. Cavani should have been celebrating a first-half hat-trick but he fired over the bar from eight yards with just Lopes to beat, and PSG were almost made to rue that miss as Lyon threatened a comeback after the break. Lacazette broke with the ball from the halfway line, and beat two PSG defenders, before firing low into the net from 20 yards. That goal came with 54 minutes gone but they rarely looked like forcing extra-time despite their fair share of possession.